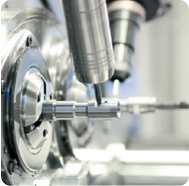 Manufacturing today is driven by increasingly complex parts, shorter cycle times and a competitive market. Utilizing the virtual machining technology of SIMNC, the CNC multi-spindle automatic turning center is capable of performing eight manufacturing operations. With SIMNC, manufacturers offer their customers a fast and inexpensive CNC machine simulation for conducting dry-runs of programs, and for correcting errors before they result in expensive mistakes.